There are three basic conditions that the flue system must meet to ensure correct operation of the Aerocowl.” to “There are three basic conditions that the flue system must meet to ensure correct operation of the Aerocowl Chimney Cowl. 1. The flue must have only two openings - an inlet and an outlet. Any other opening in the flue will allow air to be drawn in and the system will be short-circuited. Therefore there must be NO STRUCTURAL FAULTS (broken bridges, cracked pots, etc.) and the POT MUST BE PLAIN without louvres, holes or spouts. (More will be said about type of pot later). 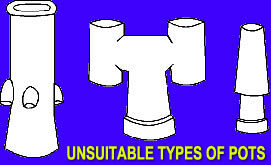 Pictured are some unsuitable pots. 2. The Aerocowl Chimney Cowl must be in a free flow of wind. The wind causes zones of high and low pressure around a building which vary according to the shape of the building, geography, etc. In this boundary layer the airflow is unstable and the Aerocowl Chimney Cowl may not function correctly. To be sure of Aerocowls operation a minimum distance of 6' should be maintained between the top of the chimney and the roof, any walls or obstructions. 7" - 10" internal diameter flues normally serving open fire burning wood or coal or fuel effect gas fires. 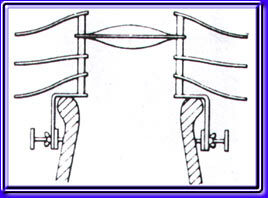 The fixing ring is approximately 2" larger then the largest recommended flue size for each Aerocowl to accommodate the thickness of the pot or flue pipes than the recommended maximum diameter. THIS MUST NOT BE DONE or the flue may be choked. The Aerocowl is placed over the top of the flue pipe or chimney pot with all three supports in contact. The clamping bolts are then tightened and secured with the locking nuts. The bolts come coated with anti-seizing compound so that Aerocowl can be easily removed for inspection or sweeping of the chimney at any time.